Comments: Kim Moore writes: This is a GREAT park. It is clean and there were lots of children playing during our visit. Dogs are PROHIBITED. This playground is on the corner of Camino de los Coches and Calle Timiteo. A little bit east of the park is the Stagecoach Community Center that has 3 baseball fields, basketball hoops and a sandpit for volleyball. It took me a few minutes to find the playground. Anonymous writes: Stagecoach Park is a very large park, and misleading because many people don't realize that there is an upper and lower section. The lower section has the playground, a man-made creek bed with rocks to climb on, picnic pavilions, and large grassy areas. Up the hill are curved stone walls for children to climb on and the remains of the original walls of the stagecoach stop for which the park was named. Even further up the hill are the ballfields and a community center. 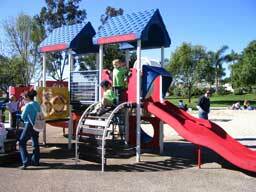 Play Equipment: This park has three play structures in one large sandy area. Two are designed for younger children (2-5), the third is a larger, taller structure for older children. There are also two sets of swings, one for toddlers, one for older children. 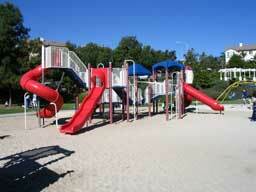 The play structures have slides, with a smaller slide for younger children. There is a large sand area. The areas around the play structures are rubber playground material.